I am going to put some effort into blogging every Wednesday and see how I do. Right now I have a ton of Disneyland photos from our recent extravagance. I had the best time ever. I don’t know if I was celebrating my 55th birthday, or my 5th. 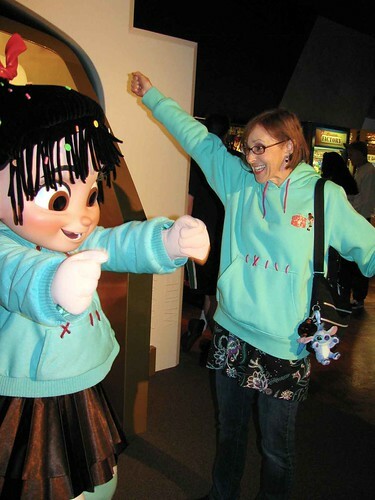 Vanellope and I are wearing matching sweatshirts. Rick and I saw the movie,”Wreck It Ralph”, the night before. I did the Sugar Rush cheer, and Vanellope went into a driving pose. In the evening on the weekends there is the Mad Hatter’s Tea Party. It is so much fun, but hard to describe in a few words. 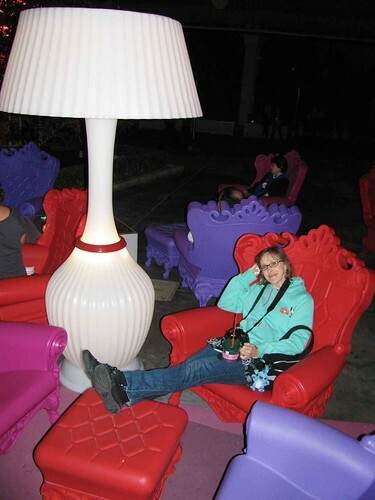 They put out these fun plastic chairs and serve frozen slushy drinks in tea cups. There is a live band featuring the Mad Hatter and Alice, and also a DJ Rabbit. Tweedle Dum and Tweedle Dee are announcers. It is a really fun way to end a day at the Parks. This entry was posted on Wednesday, November 7th, 2012 at 2:00 pm and is filed under Disneyland. Tagged: Disneyland. You can feed this entry. You can leave a response, or trackback from your own site.